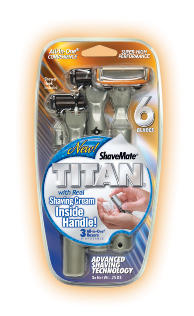 six blades & shaving cream Inside the handle, what more could you want? Just when you thought we couldn't squeeze any more blades into a razor, we fit six blades and included a shaving cream dispenser right into the handle for an incredibly close, smooth and comfortable shave! 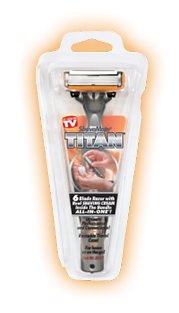 ShaveMate Titan® focuses on convenience and precision to take your shaving experience to another level. Other features include a moisturizing glide strip infused with soothing Allantoin, pivoting head and easy flow blade rinse. 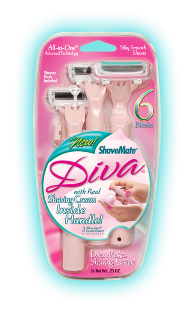 The ShaveMate Diva® is the ultimate travel companion. It contains scented shave cream in the handle for added convenience. 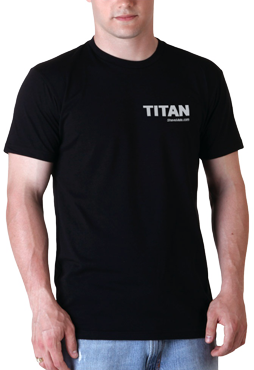 This will free up some space in your toiletries bag and give you a close, intimate shave. 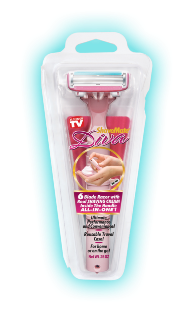 The head of the razor is flexible to get those hard-to-reach areas with ease. 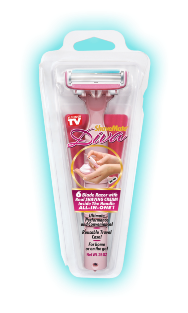 It has a moisture strip on the top of the blades for added comfort. The blades rinse clean to keep your razor performing at its best.